Only hours left when you can save money on new Fall Arrivals at Neiman Marcus online. 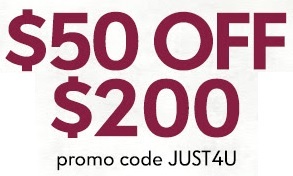 Spend $200 or more and get $50 off your purchase! The offer is valid online only. To receive discount offer, enter the promo code JUST4U in the promotion code box in your shopping bag during checkout. Source of the information is Neiman Marcus. Hurry up, the offer ends today (09/14/2016). For more details visit Neiman Marcus online.